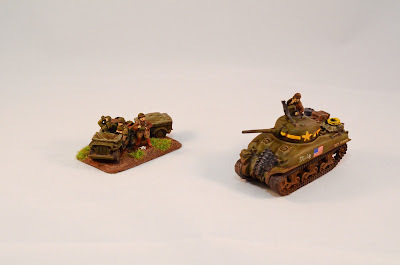 I went to the Historicon 2014 convention from the Historical Wargaming Society. It was a fun trip. Very good friends from the Black Moon store in Lebanon, NH picked me up on the way south – making the trip easier and much more enjoyable. It was a Mid-War 1485 point event – something I am not used to playing. The convention was my first Mid-War experience, and I have never played with such a low pointage. I may tell you more about the list used and how it performed on a different posting. For now, lets showcase the models I quickly painted to be able to participate in this event. Figured out my M36 90mm ones wouldn’t work out in Mid-War. Good thing is these ”M10″’s will also work for me in Late War. 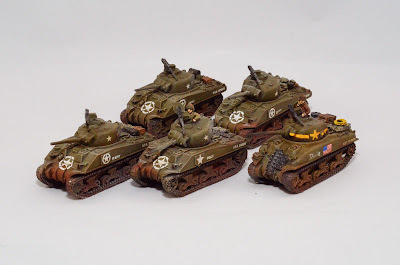 I painted the Sherman platoon. Basic M4. They tend to be the workhorse of my American Tank Companies in Late war, and I intend to use them many times. They are replacing some old tanks I got out of eBay long time ago. 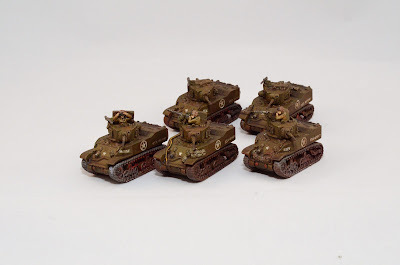 I wanted to have the tanks in matching color scheme with the rest of the army rather than the other ones I was using that, although well painted, just looked different from the tanks accompanying them. That Cole Jackson model also looks cool and will become my Company Commander in Late War. I fielded two warriors that I painted last minute, namely Major General Ernest N Harmon in Jeep and Staff Sergeant Cole (Reb) Jackson. Neither served their purpose too well and I would gladly had enjoyed an extra stuart instead of them. Said that, you are limited to the models you have when building a list – and I din’t felt like painting too many more models. Some old Stuarts that I had around. They served better than I was expecting. Way better than the Shermans. I did not painted them for Historicon 2014, but I took pictures of them and I wanted to put them here.